Congratulations on being a member of World Global Network with Helo. First things first however... how much do you know about online business and the power it has to help you run your Home Business with a product such as Helo? This simple four step system is designed to help you get started and therefore move you into "income mode" as quickly as possible following your investment in Helo. Quite simply with Helo you have an in-demand product straight out of the gate. When it comes to health and wellness people instinctively know what they need, if Helo is properly presented and explained it is simple to have people engaged immediately. Do this with enough people and you have a successful income stream for you and your family. As with anything you are looking to sell, it is always best to start with the solution, then work to how the product works to help solve the problem. In the case of Helo, the device is designed to help people monitor their own (and loved ones) health and provide early warning to health issues that otherwise may lie unnoticed for years. As a WGN Member customer you are activated to represent the company as a result of owning a Helo. WGN's strategy is simple.... use people to help people. What better way to launch a new health technology than to have people talk about their experiences? In return for this the member customer takes a share of the income each and every device sold (in their network) achieves. ​We know MLM and Network marketing has a reputation, and we also know this method of generating revenue has been tarnished by unscrupulous ponzy schemes, fly by night businesses and networks that bleed their business members dry by continuous pressure to "buy in" to remain qualified. If you have got this far in the DBM team Helo process I hope you see WGN and Helo is set up in a much more professional way - hence it has our endoresment. The business model is very simple BUT you must know what you are doing and how to apply a MARKETING SYSTEM (PROSPECTING) to the excellent SALES process that you have with WGN - Videos, Webinars, Events, Literature etc etc. Without the necessary numbers of NEW PROSPECTS and LEADS each WEEK, you will struggle to succeed in Network Marketing. At DBM we have spent years refining our online business systems and are top earners across several platforms from high ticket affiliate to Network Marketing products to E-commerce. As we built our Helo business it became clear we could help our members by providing them access to straight forward tools and skills specifically designed to get them into income for themselves as quickly as possible. 1) it takes up huge amounts of time to manually set up social media images, posts, links and blogs! Did you know on 4 out of 100 of people who make a start on line are making less than $100 per month or give up trying! Systems succeed - people fail. People procrastinate, get bored, let fear drive them and are drawn to the next shiny object.... Systems on the other hand (once set up!) do all the heavy lifting for you. 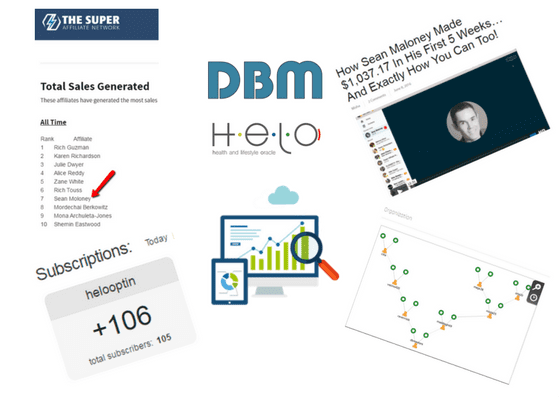 It is for this reason DBM have teamed up with some of the best advisors and marketing tools available to bring you the DBM Team Helo Marketing System....let's break it down. The flow of people to your Helo is quite straight forward. The DBM Helo Marketing Eco System is designed to help you run a continuous stream of people to your Helo product and business system. So how do we do it? Well, quite honestly we plug you into recommended products AND show you how to link them together. We also support you in this process to ensure you are making income as quickly as possible. Once set your job is to fill the "funnel", via free and paid ads, lead gen and social media work THEN follow up like crazy as you take people to the World Global Network Sale process! Once set up - a 15 minute job, we then get you sending traffic** to the same funnel - leaving you free to follow up and close those Sales! If you want access to our FREE* training and support in setting up an online business marketing system - fill out the below and we will be right back to you! * The purchase of the Power Lead System to do the job is required - $54 per month minimum. Marketing Funnel share codes available to DBM PLS clients ONLY. ** Traffic cost can vary between $0.30 to $2.00 per click. Quality and timing can vary. DBM cannot be held responsible for the quality of lead traffic or your ability to close a sale.